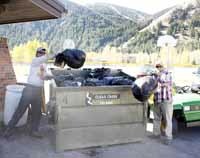 Ketchum's parks go through 100 black trashbags a day in the summer and early fall. That gave Jennifer Smith, superintendent of the city's Parks and Recreation Department, all the reason needed to switch to Greenup trash bags. Greenup is a fledgling Ketchum company—incorporated in January and opened for business in March—that produces plastic trashbags and eating utensils that decompose in two years. This is quite a change considering the Environmental Protection Agency estimates that decomposition for an ordinary plastic bag may take a century or more. Plastic is petroleum-based, meaning it uses a byproduct of the refining process when oil is turned into gas. Greenup's plastic is no different in this sense, but a unique ingredient is added to the mix. Greenup co-founder Will Roos said this additive creates a "scission" in the plastic's molecular structure allowing oxygen to bond and create a food source for microorganisms to biodegrade the plastic. "We can tailor the decomposition time by using more or less additive," Roos said. Smith bought a year's worth of bags up front to make the cost equal to what it was paying before. Greenup sells 32-, 43- and 55-gallon trash bags. The 32-gallon bags come in a pack of 250, costing about 21 cents per bag. Shopping for Hefty's 30-gallon bags at Walmart costs about 19 cents per bag. Buying Earthsense's 33-gallon bags—consisting of 60 percent recycled plastic—costs 17 cents per bag at Costco. Smith said she doesn't recall how many trashbags the department uses a year, but it's obviously a lot. "It's amazing how much garbage is generated," Smith said. "Garbage and dog poop." She said the Parks Department also takes care of dog-poop stations. "We haul off a ton of dog poop a month," she said. And when Smith says a ton, she means it literally—one ton—and laughs when she says it. "You have to develop a sense of humor if you're a parks janitor," she added. Greenup doesn't make a bag small enough for dog poop, but Smith said she'd be interested. Greenup isn't even a year old yet, but Roos said it's already planning to expand into household goods. "I don't know if we're profitable yet," he said, "but we're starting to take off." The company is in the midst of several deals with Southern California school districts and national-chain businesses, but Roos said he didn't want to provide specific names before contracts are finalized. Greenup's products are in Arizona Grand Resort in Phoenix and on sets of several Warner Bros. movies. Roos said Greenup is also eyeing foodservice-products distributor Sysco and Gem State Paper and Supply to carry its products. "If we could lock up these relationships, we'd be set," he said. "We see growth as around the corner." This would be good news for Ketchum and the Wood River Valley because 31-year-old Roos—who grew up in the valley and graduated from the Community School—and 30-year-old co-founder Jay Schapira from Los Angeles want to make this Greenup's home. The company's communications director, Whitney Werth, 33, also grew up here. Both Werth and Roos moved to the San Francisco Bay Area to spread their wings after college, but the Wood River Valley eventually called them back. Roos said Schapira had visited a few times and bought into making the valley the base of operations. He said today's technology allows a business to be planted almost anywhere. "If we could do it from anywhere, what better place than Idaho and the valley?" Roos said, adding that other young professionals can also do the same. "Everyone wants to live in the valley, but they give up because of the perceived limited opportunities." However, the valley does have its constraints. It can't provide a factory to build the plastic products. Roos said production is currently done in Los Angeles. "We could move into Idaho in coming months," Roos said, adding that a factory capable of meeting Greenup's needs has been identified in Twin Falls. Roos admitted that the Ketchum parks contract isn't, by any means, bringing in an abundance of revenue. But it will help to get the word out. And the city of Ketchum is happy to work with Greenup, according to Economic and Development Director Lisa Horowitz. "This is a win-win," she said. "We are furthering our commitment to green practices, buying local and helping a new Ketchum company gain exposure." Besides quick breakdown, Greenup's plastic products are also recyclable. But fast decomposition is key because Americans simply don't recycle much plastic. The EPA annually tracks the amount of waste generated in this country by weight, finding that discarded plastic increased 7,605 percent from 1960 to 2008, the latest year for data. However, the country's overall trash production increased by only 183 percent. Plastic trash totaled 390,000 tons in 1960 and 30 million tons in 2008. Plastic has become the second most thrown away item behind paper and cardboard. However, the EPA reports only 7 percent of plastic is recycled, a minute amount considering the usual recycle rate, for any item, is 33.2 percent. Plastic trash bags are one of the least recycled plastic products, not even being able to be recorded. The EPA estimates that 930,000 tons of plastic bags were thrown away in 2008.